This was a demonstration piece that I worked on at craft shows through 2014 and finished off in early 2015. Cheetahs are usually shown running or hunting, but I wanted to show one in repose with an acacia tree nearby, making it a cool resting spot. 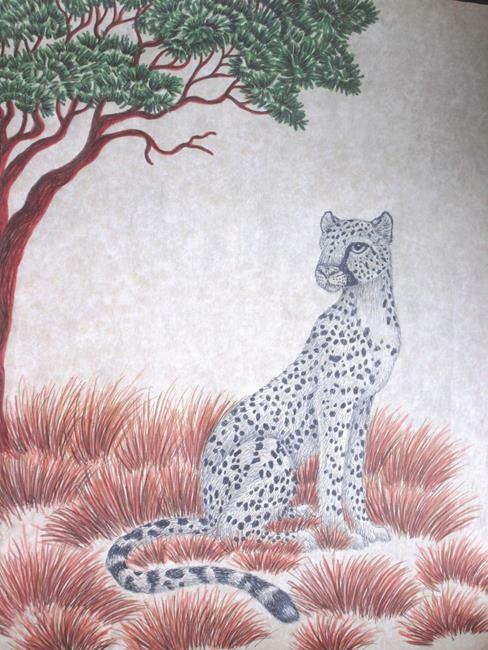 The picture is done on toned calligraphy paper and a pal suggested leaving the big cat only done in black, without any brown or other colors added. Obviously, she knew what she was about, as this drawing won a Second Place ribbon at the 2015 Westlake-Westshore Arts Council Juried Show.